Panasonic, Japan is a key name when it comes to cooling and heating solutions. 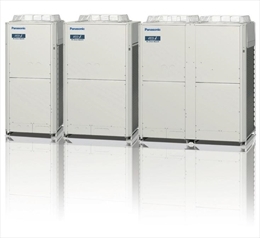 Recently the company came out with a next generation VRF air conditioning solution in form of the FSV- Eco Extreme (EX). About the FSV-EX it can be said that it is a new, state-of- the-art Variable Refrigerant Flow (VRF) system that has been engineered to take energy efficiency to an entirely different level. Variable Refrigerant Flow Systems (VRF) is called “Rolls Royce” of air conditioning systems. A typical VRF system comprises of an outdoor unit that may contain one or multiple compressors. The outdoor unit is connected to several indoor units or air handlers through refrigerant piping. The communication wiring is comprised of a 2 wired cable. These form a loop connecting all the indoor units to the outdoor unit. Here are the top features of FSV-EX. •	The unit has highest EER rating in all outdoor capacities. It is a durable unit with strong cooling power. It can operate effortlessly delivering optimal output amidst high ambient temperature. The cooling operating range is from -10°C to 52°C(outdoor temperature) and heating range is from -25°C to 18°C(outdoor temperature). •	The unit is integrated with new all-Invert er compressors. These can be regulated independently to get flexible output. •	The heat exchanges are designed to have triple surface area compared to an ordinary unit. This allows a better heat transfer. •	The curved air discharge bell-mouth is designed for better aerodynamics. This assures smooth exhaust flow. It helps to keep the sound level low with more volume of air. •	A regular VRF unit wastes a lot of energy in recovering oil form indoor units. The FS-EX has a 3-stage oil recovery design to minimize the frequency of forced oil recovery. These cuts down energy cost and increase levy of comfort. •	The better COP of the unit also makes it an energy efficient device. The 8 HP Cooling systems have a COP of 5.30. •	It offers whisper-quiet operation by using better compressors, larger fan and better design. •	There is panel which has the controls to regulate all the units of the variable refrigerant flow system. The system can be controlled with a modern LCD individual controller, wireless remote controller and Centralized System Controller can be used in the system. •	Remote control through the internet can be enabled by using the Web Interface Systems.